Tension was thick in the morning hours leading up to the Lionguard's final strike against the karka threat. Only yesterday adventurers had fought alongside Inspector Ellen Kiel to wrestle the shoreline of Southsun Cove from the karka, securing a beach front and pushing through to establish roads further inland. While the Consortium investigated nearby ruins and collected karka egg specimens, the Lionsguard proceeded to establish a forward base on the edge of the Scoured Plains. 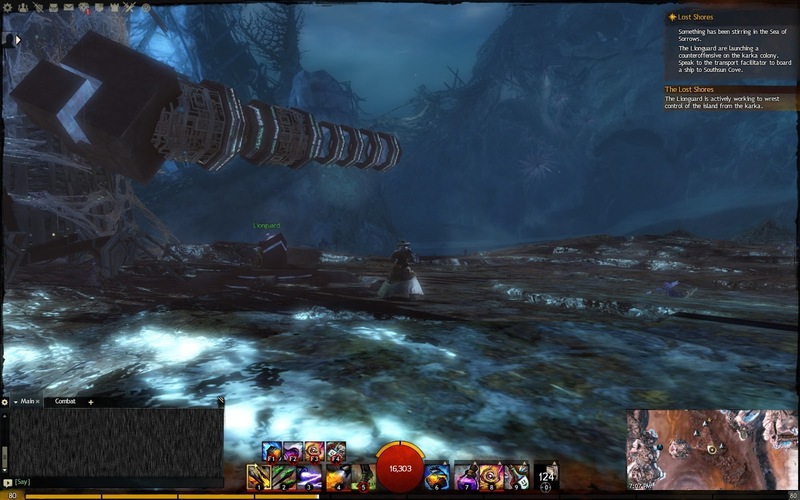 Adventurers woke to find a new design of catapult, along with asura cannons constructed along the front lines, their sights focused on the karka hive where the Ancient Karka that had been terrorising Lions Arch slumbered. Yesterday the hive had been blocked off to all adventures by an indestructible webbing, taunting us with the points of interest and rich orichalcum veins within. Now it appeared the Lionsguard were making plans to break through that impenetrable wall and take the fight directly to the karka's home. 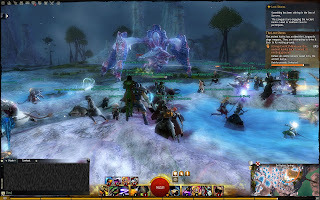 Adventurers from all over Tyria gathered in those last moments leading up to the final battle, converging on Canach's Folly to witness the grand finale, summoned by a mass-delivered letter from Inspector Kiel. Upon arrival at the forward camp they found a group of demolitionists just itching to get into that hive and blow it into the mists. Kicking off the final push, the Lionguard fire the cannons, ripping a hole in the webbing. 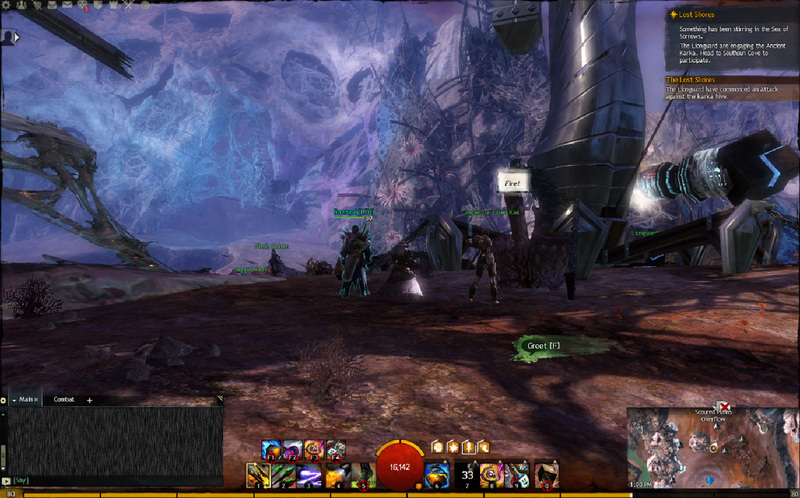 Adventurers and demolitionists alike swarmed through the gap, overwhelming the young karka. Enraged by our attack, veteran egg-layers rose up from the depths of the hive, led by their champions. The fight was severe and bloody, and many lost their lives, but after much effort, the demolitionists placed their charges, ending at the top with a grand battle confronting another champion karka and several veteran egg-layers. Our mission complete we escaped from the hive, racing across the Seashell Hills and back to the safety of Canach's Folly and the asura cannons. There we met with Inspector Ellen Keil, who was preparing to use the cannons against the karka still remaining in the hive, triggering the explosives in the process, except her plans are foiled at the last moment. The Ancient Karka was never in the hive. We were now required to force it back into sight of the cannons so that the Lionsguard could finish what we started. We found the Ancient Karka in the Driftglass Plains, stubbornly refusing to budge an inch. The tree we felled changed its mind though, but not the way we had hoped. Instead of heading towards the hive, the creature retreated further away and proceeded to summon waves of veteran karka to fight back. 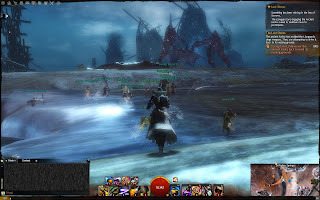 Wave after wave of karka attacked us, and for the next hour we fought tooth and nail to keep the upper hand. 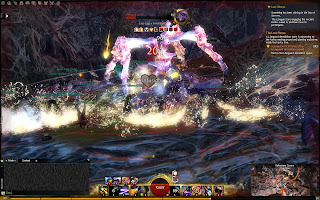 When victory seemed close, we were confronted with a wave of veteran egg-layers, followed by a champion karka. 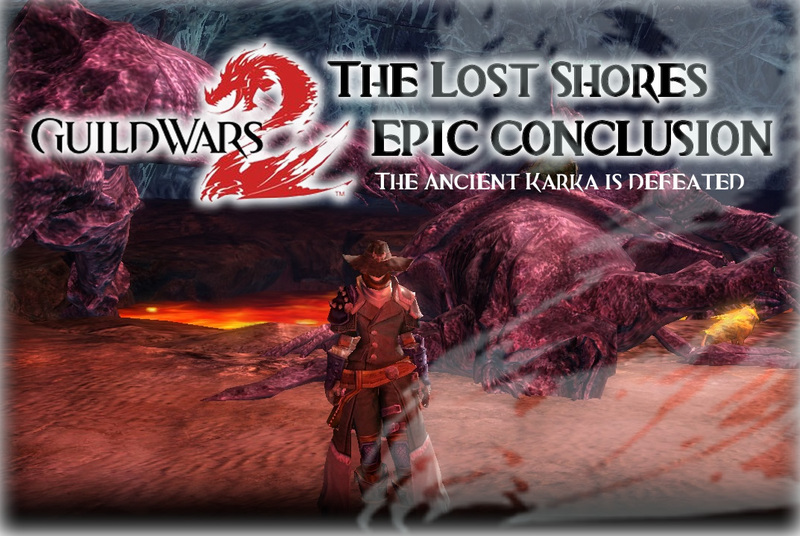 Suffering through the severe latency issues we were dealt at this point, the adventurers struggled to win the fight against the karka and drive the boss back towards the Scoured Plains. 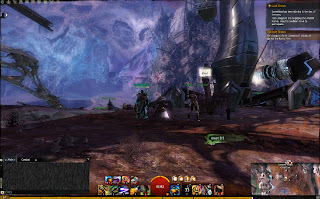 At the end of the hour long battle, we made headway, chasing the Ancient Karka into a region full of geothermal fissures. Ripping the webbing off the fissures, we used their pressure to launch boulders at the Ancient Karka, driving down its will to fight on. The creature at last gave up the fight, retreating into the Scoured Plains, but it was not over yet. Regaining courage, the beast summoned more veteran karka, along with egg-layers and their babies. The battle was fierce, and the adventurers were pushed back onto the bridge to Captain's Retreat, but after much toil and pain, we succeeded, only to be confronted by three champion karka. The battle raged on, and eventually we forced the Ancient Karka back into the Seashell Hills. The battle was not over yet though, we still had to drive the Ancient Karka back into the hive where the trap we'd set waited for it. We achieved this by destroying gas nodes around the area that had been blocked by karka webbing. Each exploding node forced the creature further and further back, until it retreated within the confines of the hive. Sensing her eminent victory, Inspector Kiel ordered the Lionsguard to charge the cannons, preparing to fire again. It was up to the adventurers to keep the Ancient Karka busy until the cannons were ready to fire once more. The creature fled to the top of the hive, and we followed, free to run up the path previously cleared of young and veteran karka. At the top we found the Ancient Karka hiding amongst the webbing, which had covered the previously placed explosives, leaving us with no other option but to destroy the webbing in order to reset the trap for him. With the webbing destroyed, the karka fled back down to the bottom of the hive, using a rolling move to crush all opposition in its way, but little did the karka know, but that was where we wanted it. Cornered, we at last launched an all out offensive on the Ancient Karka itself, paying it back for all the terror it had unleashed, for the citizens of Tyria it had murdered and the damage it had done to Lions Arch. The creature was helpless against our fury and it fell to our blades, weakening. The time had come, the cannons were charged, the explosives set, ready to blow. Inspector Ellen Kiel gave the final command, and the cannons fired, striking the Ancient Karka and explosives. The ground beneath it ruptured, revealing the lava below, and the creature was swallowed whole, consumed by the fires. Making one last effort, the Ancient Karka rose up again, emerging from the lava to struggle onto the land, but its burns were severe, its wounds fatal. The karka took its last breath and died, the adventurers and Lionsguard standing triumphant before it. Victory was ours. 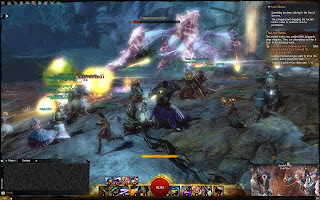 Having defeated the karka threat once and for all, the adventurers were rewarded with an enormous event chest containing unique and exotic treasures. Every adventurer was given a 20-slot karka themed bag, an exotic earring that gave +25 to all stats as well as +5% magic find, two random exotic items, and a handful of other, lesser rarity, random items. Satisfied with the outcome of the three-hour long event, latency issues forgiven, the adventurers returned to Canach's Folly, which now stands as a Lionsguard outpost, to stay until the remaining karka are found and the island is freed of their terror for good. Players left happy, thankful that the final day of the event had not been a complete disaster like the second day had been. Now all that remains is to explore every inch of the island, complete the jumping puzzles, gather the karka shells used to create newly added items, and explore the very depths of the Fractals of the Mists. 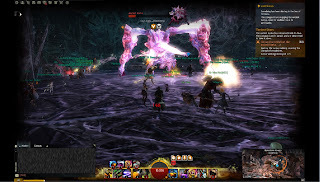 Already there are reports of players reaching difficulty level 4 or 5, and who knows what awaits them as the dungeon continues to get even more dangerous.